Even when I'm doing a certain diet, or pushing myself to go eat and live healthier, there's one thing that never fails to hold me back. You can take away my rice, pasta and bread. You can even take away my bacon! (Yes, I'm not kidding! Bacon!) But don't you ever strip me away of desserts! I'll even agree to workout harder just to keep me my sweets! And I actually did that after being treated with tons of goodies from Chez Karine's newest branch at SM Mega Fashion Hall, which if you didn't know yet, is the latest expansion of SM Megamall. 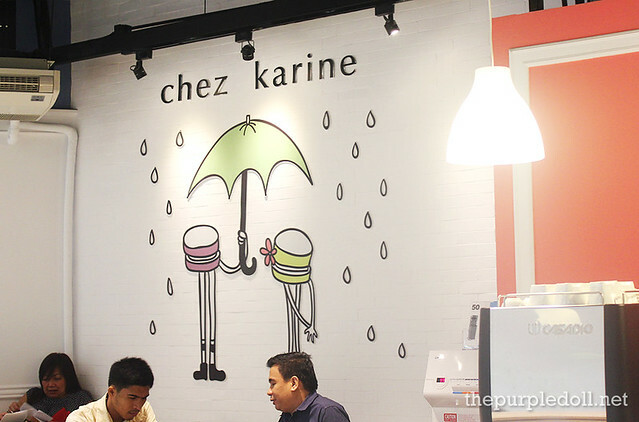 Owned by pastry chef Karen Yang-Chiang, Chez Karine which translates to "at Karen's place" and has been famous for its macarons, is a neighborhood bakery that first opened in Serendra. I've been to the place a few times now, but not as often as I'd want to. 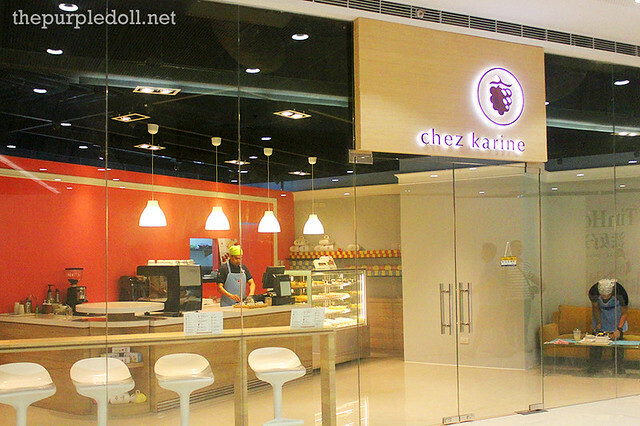 However, now that Chez Karine can already be found in SM Megamall, I don't have an excuse anymore not to frequent the shop. Trivia: It's pronounced 'shey-karin', not 'shez-karin'. Learned that just recently. Hehe! 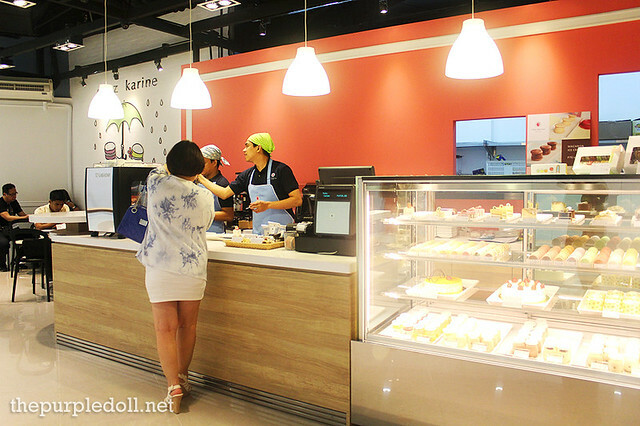 Compared to Chez Karine's Serendra store which can only sit about 10 people, the new branch is bigger and seems more like a cafe than just a plain dessert shop. There are tables for four, a counter seating, and even a couch for those who prefer a more relaxed dessert-eating and chatting session. Facing the entrance also stands the cashier, as well as the glass display chiller where you can pleasurably ogle at the shop's fine treats. Click the photo to enlarge menu. I got to try several flavors of Chez Karine's macaron already. And three of which I always get when I'm at Serendra are their dark chocolate, pistachio and earl grey flavors. However, Chef Karen has developed even more interesting variants! 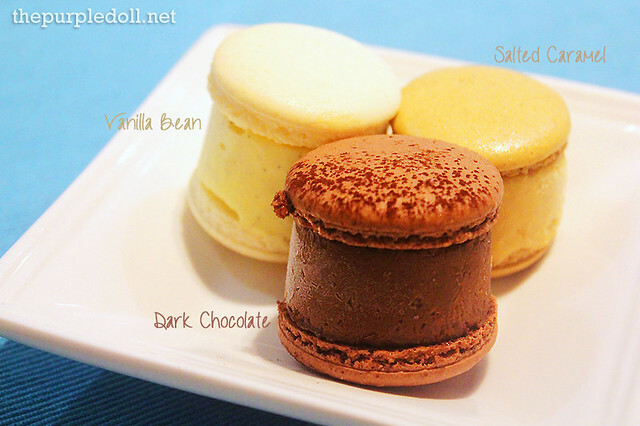 Some of the newest seasonal flavors of Chez Karine's macarons are these four. They might seem priced a little steep, but their quality and even their size justifies the price tag. Each one of them is airy, with a crisp yet delicate outer layer, and a slightly chewy interior. All four also stayed true to their flavor, and don't taste artificial at all. Red Velvet - I love red velvet cakes, cupcakes, anything, and this wasn't an exception! You get a nice cocoa flavor with hints of cream cheese. Every bite also gives off just the right amount of sweetness. Maple Bacon - I don't normally fall for bacon-infused desserts as most of them don't taste like bacon anyway. Some just use the texture, but I haven't encountered one that really gave off a bacon flavor. Not until I met this macaron. Every bite just oozes with salty and slightly sweet maple goodness. There are bits of bacon too for added texture. Definitely a must-try! Black Sesame - I love black sesame in desserts, and this is another one of my favorites. The black sesame gives off a nutty, slightly toasted flavor that goes really well with the creamy profile of the vanilla-based macaron. Matcha Red Bean - I have to admit, I'm torn between the maple bacon, and this particular flavor if you'll ask me which macaron is my favorite. I've always loved the combination of matcha and red bean -- bitter and sweet, a little grassy and slightly nutty. And this macaron didn't fail to bring out the best in this popular Japanese combo. Every component is well-balanced, and not one note is overpowering. If you love matcha, then this is a must-order! 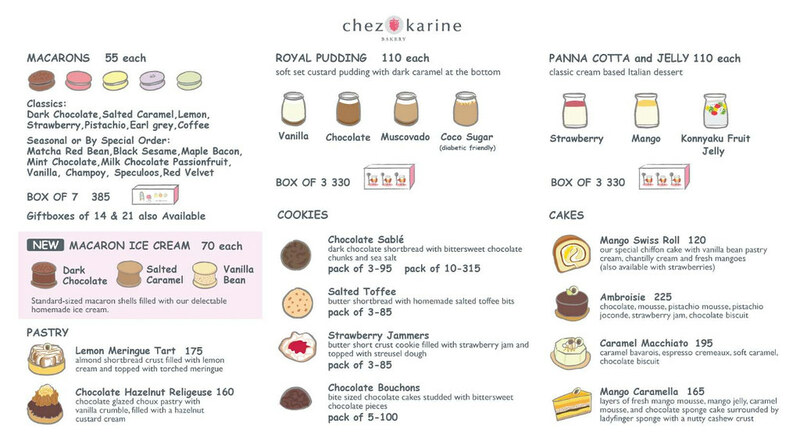 Another addition to Chez Karine's list of sweet treats is the macaron ice cream which comes in three different variants. These macaron ice cream sandwiches have the same light and airy macaron buns, but with a thick ice cream filling in between. Dark Chocolate - I've always been in love with Chez Karine's dark chocolate macaron, so it wasn't surprising that I also dig its macaron ice cream version. Rich, dark and uncloyingly sweet, this is a perfect treat that's sure to brighten you up even on bad days. Vanilla Bean - I'd definitely have this vanilla flavor again when I'm looking for something familiar yet equally as satisfying. It's light, creamy and a safe choice if you don't know which one to get. Salted Caramel - This is probably the most interesting flavor out of the three. Not that I haven't had salted caramel ice cream before, but it's the fact that this macaron ice cream doesn't come off as salted caramel for me. Even my friends agreed that it has more of a coffee note. Nevertheless, it's a really good variant, and perfect to pair with coffee. Think we only had macarons? I told you we had tons of desserts at Chez Karine! So after sampling the macarons and macaron ice cream sandwiches, we had a taste of the cakes next. My choice of drink for this session might be off. But, can you blame me? I just wanted to cool down after a hot and humid trip on the bus and MRT. 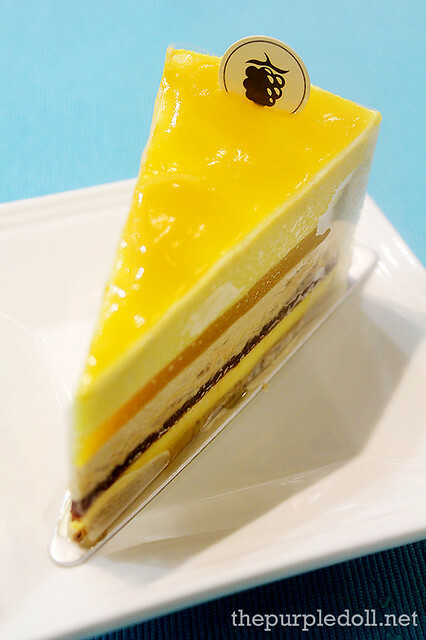 One of the cakes we sampled was the Mango Caramella which had layers of fresh mango mousse, mango jelly, caramel mousse, and chocolate sponge cake with ladyfinger sponge and a nutty cashew crust. With this many layers, you're bound to enjoy different textures and play of flavors that go cohesively together. Every forkful was light, fruity and slightly sweet. This is definitely a nice, refreshing cake perfect for summer! Next, we had the Chocolate Earl Grey Igloo, a dome-shaped cake with bittersweet chocolate and earl grey mousse, and a chocolate biscuit base. I like my chocolate more bitter than sweet, and that's probably one reason why I love this cake so much. The rich and dark chocolate mousse also blends really well with the earl grey layer. And of course, the biscuit base doesn't only hold the cake together, but also gives an enjoyable crunch. 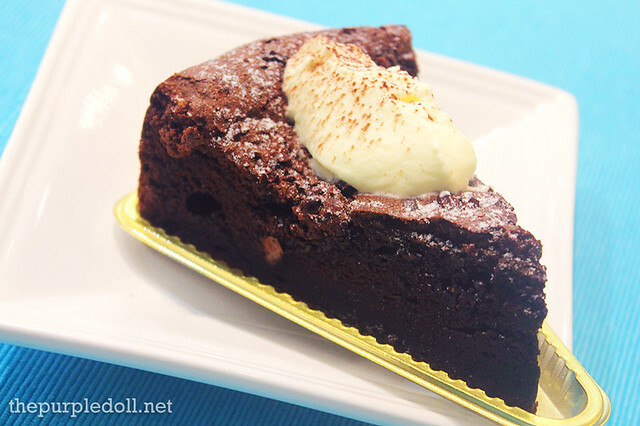 Whether or not you're a fan of earl grey, this cake is definitely a must-try! I love anything with berries, so I was really excited to try the Neapolitan which had layers of fresh strawberries, raspberry mousse, vanilla and chocolate bavarois, and chocolate sponge with almond joconde. Just as how it looks, this cake is very light on the palate. We didn't even have a problem finishing it! You get a slight sweetness and hints of refreshing berries. I can only think of having some hot tea when we had this cake. 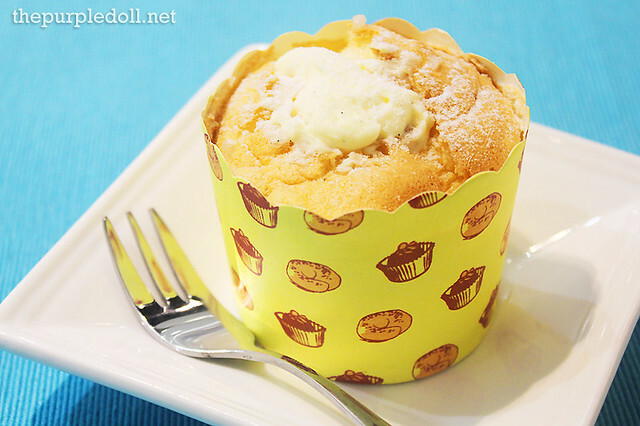 Another new item at Chez Karine is the Hokkaido Cupcake. This Japanese-inspired cake is super light and super fluffy. I normally shy away from cupcakes and muffins since more often than not, they're very dense. However, being Japanese-inspired, this cupcake is the opposite. You don't even need to chew! You can just let it melt in your mouth. That's how soft this cupcake is! It's also filled with fresh vanilla cream that makes every bite all the more enjoyable. So for soft, light and fluffy cake lovers like me, this is for us! We also didn't miss trying the Classic Chocolate Cake -- dark chocolate cake topped with cocoa nibs and dusted with powdered sugar. Just like any great chocolate cake, this slice was soft, moist, rich and has just the right bittersweet chocolate goodness, with a bonus of cocoa nibs. Definitely a perfect partner for a hot cup of coffee. 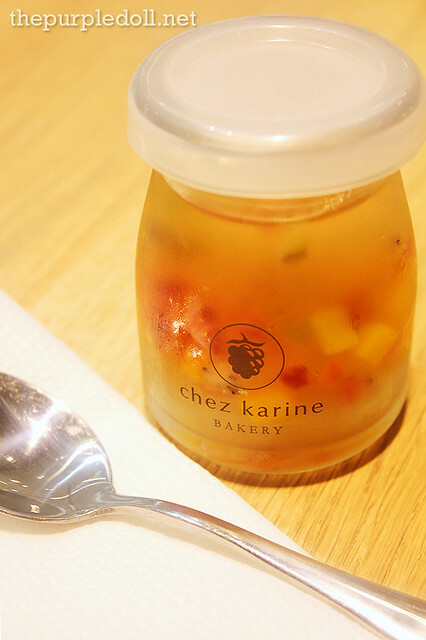 Aside from the cakes, we also got to try a few of Chez Karine's pudding and jelly. Ever since they opened their Serendra store, I was one of those who was initially a critic (mostly because of the hefty price tag), but ended up becoming a convert. First, we had the Muscovado Royal Pudding which is one of the dessert jar variants I've already tried before. This dessert has soft custard pudding with muscovado sugar on top; a really nice, light and uncloyingly sweet treat with hints of earthy muscovado. Yum! 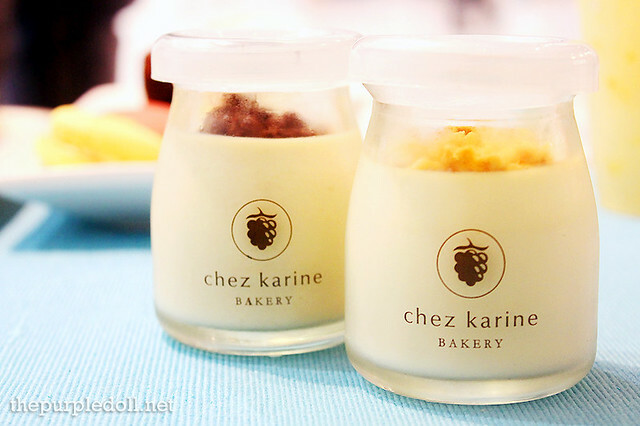 Then, there's also the Cereal Milk Pudding, one of the newest dessert jar offerings at Chez Karine. This is also made of soft and light custard, but what makes this really enjoyable is how the cereal flavor is infused into the milk pudding! The cereal bits on top also add a pleasurable crunchy texture. And while I'm not really a milk and cereal person, this is without a doubt my most favorite dessert jar variant at Chez Karine. On a separate visit, I tried the Konnyaku Fruit Jelly since my favorite cereal milk pudding was already sold out. 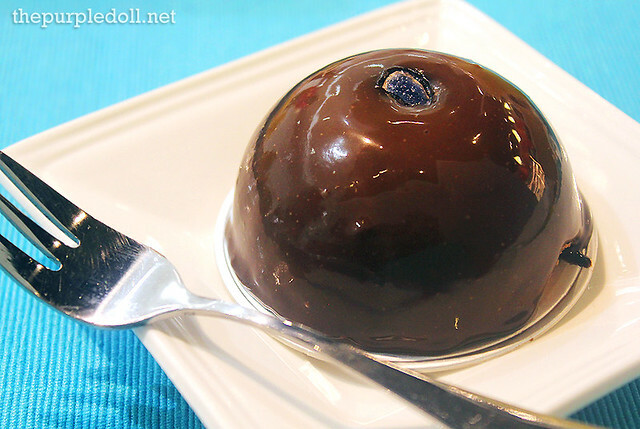 Unlike the other 2 puddings, this one is made not from milk nor cream but from a jelly-like substance made from the starch of the konjac yam plant. 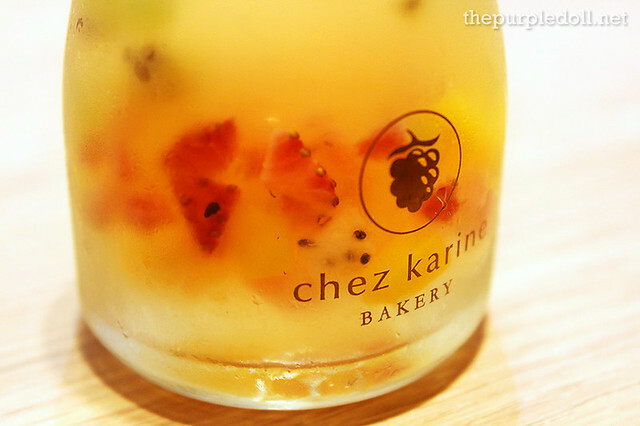 It's basically just like a jello, but healthier, then flavored with bits of strawberry, kiwi, mango and other fruits. 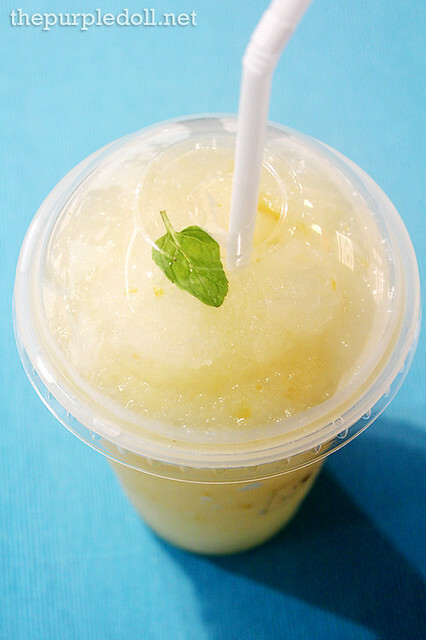 Just as how it looks, every spoonful is light and refreshing. I know, I know, the dessert jars are pretty expensive for such a small portion. That's actually the only issue I have with these items. However, you can take home the cute glass jars, so I guess this is one way you can maximize what you've paid for. Oo nga eh! My blog misses you so much na, Mich! 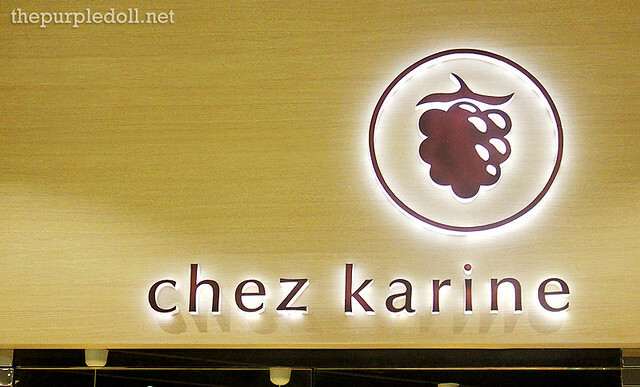 :D Anyway, when you visit the metro, check out Chez Karine! ;) I'm sure you'll like it! According to this diet regimen that I'm currently doing, we should not deprive ourselves from sweets, lalo kasi tayong kakain ng madami once pinigilan natin sarili natin... Too bad we don't go to Megamall, I hope they open a branch somewhere here in Marikina or maybe somewhere North! wow! they now have at sm megamall! :) That's just great! I love their macarons! 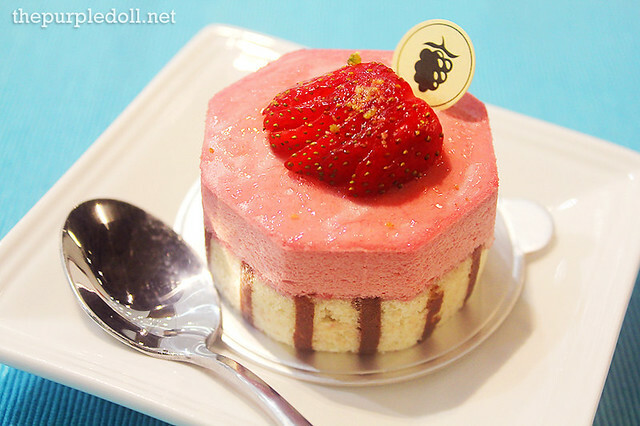 Soooo cute, sooo Japanese in style... scary lang yun calories but I want to try some of Chez Karine's desserts too. Oh my! I have been seeing this place, I didn't know that the desserts are yummy. I will definitely try this when I go back. The Salted Caramel is haunting me!!! i have tried different macaroons already from different store. Hope Chez Karine will never fail to surprise me! I like the Red velvet and the Dark chocolate macaroon ice cream! I like Mango caramella for the cakes! I supper duper love mangoes!!! I died! I need to try these macarons esprecially thr maple bacon and matcha. Yuuum! Unlike you, I can live without desserts! Lol! But hey, I love to eat sweets once in a while, and I'd surely like to try Chez Karine's Mango Caramella and Macaron Ice Cream. love macaroons,wish i could have it now. No one should hold back from these treats! So yummy! Love to try that pistachio macaroons:) Only, it's kinna far from us, hope they'll open a branch in SM North soon. Mouth Watering Desserts! A must-try! Oh dear macarons. Been looking for a place that sells macarons in megamall. So glad I stumbled upon your blog.